There are two Offer forms in Broker Brain that are appendable; in other words, pages can be added to them. The appendable forms are: the Purchase Addendum Letter and the Purchase Addendum Legal Form. In order for attached documents to be appended, they must be .pdf files. Before you can append an attachment, you must add it to the form. For more information on adding attachments, see Adding Attachments. 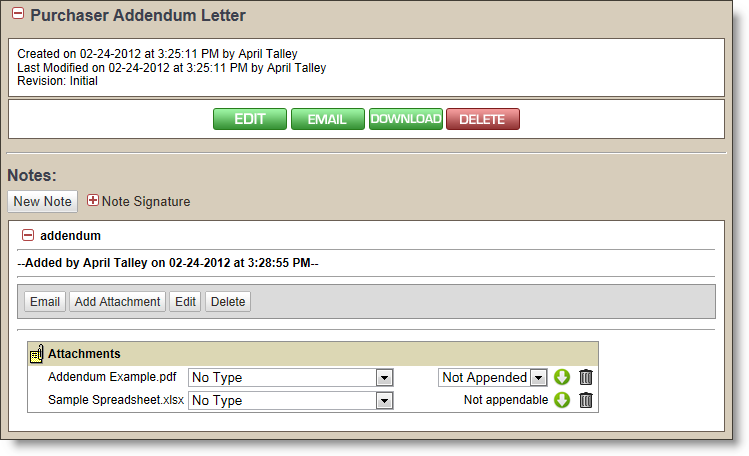 In the screen shot below, we have attached two files to the Purchaser Addendum Letter form; an .xls file and a .pdf file. While the .pdf file has not yet been appended (a.k.a., added to the form), it can be. The .xls file, however, cannot. 1. Click on the drop-down arrow next to Not Appended. 2. Select First (1). Once you have done this, the .pdf file will immediately become part of the form. If you are appending more than one file, this is how you determine the order they will appear at the bottom of the form. Select First (1) for the first appended document, 2 for the second, and so on. 3. To view the appendment, click the green Download button above the Notes section, open the document, and scroll down to the bottom of the form. The file you attached will appear as a separate page at the bottom. Only .pdf files can be appended to these forms. File formats such as .xls, .doc, etc. can be attached as above, but they will always remain as separate attachments. If a form is not appendable, you will see "Not appendable" next to the form, and there will be no drop-down arrow, even if the attachment is a .pdf file.